Bramble Hill Farm provides living and working spaces for a range of people and projects that test innovative ways to build a sustainable, healthy, and creative farm centered community that benefits the broader population. The 120 acre farm is located in Amherst, MA and is supported by the Open Field Foundation. In the spring of 2003, Nell Thorne designed and planted a theme garden for the 3-5 year old summer campers from the neighboring Common School. She took as her motif Mr. McGregor’s Garden from Beatrix Potter’s classic storybook Peter Rabbit. This garden was such a hit with the children that Bramble Hill Farm decided to continue and expand the project. Under the direction of Hans Leo, the project has grown into a one-acre teaching garden utilized by the area education community. 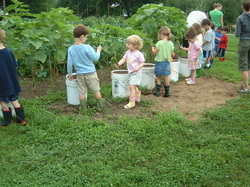 In addition to the Hitchcock Center for the Environment, The Common School has become a regular user of the garden and plants a pumpkin patch annually to pick in the fall. The pumpkins are then baked into pumpkin bread and donated to local community programs before Thanksgiving. A potato patch was added in 2008. A teacher from the Common School added a garden for the cultivation of fiber and dye plants in 2010. During the summer months Farmer Hans has been known to take on one or two apprentices. For more information, contact Hans Leo at Bramble Hill Farm: (413) 253-8903.